Diamonds do need care to keep them at their brilliant best. A clean diamond will reflect light better and allow its brilliance to show. That added brilliancy makes the diamond look larger than one that has been "dulled" by oil from the skin, soaps, cosmetics and everyday activities. Because diamonds are usually worn on a daily basis, we recommend that diamond jewelry is cleaned at least once a month to prevent Diamonds seem to be attracted to grease and I would like to add that they seem to attract dusts like a magnet. We find that cleaning diamonds to be totally free of dust or grease it one of the most difficult tasks in jewelry. We recommend cleaning your diamonds at least once a month to keep them on glowing their brightest. Prepare a small bowl of warm soapy water. Use any mild liquid detergent that does not contain "soap" for it creates another type of "film" on the surface of the diamond. We do not recommend the use of any abrasive cleaners for any type of jewelry. Brush pieces gently with a tooth brush and rinse well. A hair dryer may be used to finish drying the jewelry. 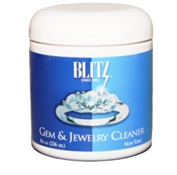 Gem & Jewelry Cleaner Blitz is ideal for cleaning gold jewelry, platinum jewelry and diamond jewelry. The cleaner may also be used on rubies, sapphires, amethysts, auqamarines, garnets, periodt, topaz and other non-porous precious and semi-precious stones. Each 8oz jar comes with a basket to retrieve your jewelry from the solution as well as a small brush to help remove any larger particles. Another home cleaning process you can do is to make a cup of a solution containing water and household ammonia or similar product like Mr. Clean. We recommend about 3/4 part of water and 1/4 parts of the cleaning chemical. Let the diamond jewelry soak for about 10 minutes and with a tooth brush gently tap around the back and front of the mounting and if you can, try to reach behind the mounting where dirt would have accumulated. Rinse it well and dry it with the help of your blow dryer. (We don't recommend the use of towels for drying your jewelry). This is the second best option (the best option is to bring it to Hannon Jewelers) for maintaining the brilliance of your diamonds. We offer a home version of the professional ultrasonic cleaner unit which you can fill with water and detergent. It creates a high-frequency turbulence with can clean most of your jewelry. There are some exceptions to what pieces of jewelry are safe to use. Some gemstones are not to be exposed to this procedure. Please contact to us for more information. 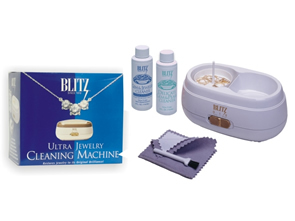 This Ultra Jewelry Cleaning Machine features twin tanks, one for cleaning and one for rinsing, two speed cleaning action, as well as a jewelry basket and a brush. Included with the machine is our 4 fl. oz. Gem & Jewelry Cleaner Concentrate, our 4 fl. oz. Delicate Gem & Pearl Cleaner and our Jewelry Care Cloth. Electric approved. If you can, you may avoid using your fine jewelry while playing sports (working out in a gym is included here) or when you do any kind of rough work. Even though a diamond is the most durable natural crystal structure known to man, it can be chipped by a hard blow along its grain. When you are not using your fine jewelry, try to separate them individually. Diamond pieces in a drawer or left in contact with other jewelry in a jewelry case can scratch each other and also can scratch other jewelry. 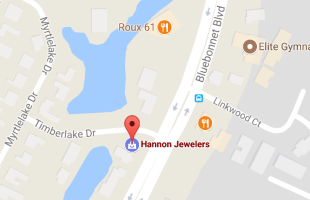 Hannon Jewelers recommend periodic inspections of your jewelry. Once or twice a year cleaning, inspecting and restoring the condition of your fine jewelry would extend the life of your jewelry considerably.